The Inuit hunters make their way across the ice slowly, cautiously, their bodies hunched low to the snow-swept ground. They position themselves behind a drift, rifles steadied, and take careful aim. The crack of their guns sends the caribou into a panic and the herd retreats, but a dozen or more of their number now lie still on the ground, their pelts and the snow beneath them darkening with blood. The hunters gut their quarry swiftly, beheading the caribou and trussing their legs with practiced ease onto the sleds for the journey home. The sky is darkening, weather mov- ing in, and they dare not linger. The program ends shortly after that and I turn off the TV, my gaze shifting out the porthole of my stateroom aboard the Ocean Endeavour. We’re sailing out of Kuujjuaq, at the mouth of Ungava Bay, and the waters of the Hudson Strait stretch on, cobalt and without end, lit by the late-setting sun of the Arctic summer. Dinner was roast beef, asparagus and French onion soup followed by creme brulée and the onboard pianist tinkling away at Thelonious Monk in the Nautilus Lounge. Before bed I’m taking advantage of the 1970s-era NFB documentaries on my in- room entertainment system, trying to come to grips with the place I find myself today. The ship rocks gently side to side and my eyes grow heavy. Somewhere beneath me the engines thrum steadily, lulling me to sleep. I’d been referring to Adventure Canada’s 12-day voyage through the Canadian Arctic to Greenland as an “adventure cruise,” but I’ve quickly realized that I’ll need to find a different descriptor. My shipmates are largely grey-haired and bespectacled, more suited to the comforts of city life than traversing the sea ice by dogsled, but the spirit of our journey remains one of exploration. We are here to meet the people who live in this land and experience their culture, to observe walrus, whales and polar bears through binoculars, and take in the beauty of the Arctic in its myriad forms. For a region that makes up such a huge proportion of my homeland, I know shockingly little about the Arctic. The odd CBC nature doc, Stan Rogers’ Northwest Passage, a passing familiarity with Inuit art. It’s strange how we consider the North an afterthought. Understandable maybe, given the climate, but still vexing. It feels like it’s my duty as a Canadian to learn about this place. This is a rare chance to experience a part of the country few Canadians get to see: the North, the real North, the True North Strong and Free. sharp focus before my eyes. The bear patrols the cliff base looking for a snack of bird’s eggs and fledgling chicks unlucky enough to have plunged from their cliff perches onto the rocks below. The Zodiac pilot’s radio squawks again. “Looks like we’ve got a couple more bears further up the beach — hang on everyone!” And we’re off again, the frigid wind and spray off the water driving its way through our clothes. It’s a mother and two cubs this time, moving towards us in the direction of the big male. We join another pair of Zodiacs in the rolling sea, all of us keenly watching the family as they pick their way along the sand, mother in the lead, cubs safely behind. Female bears spend two years raising their cubs, teaching them to hunt seals and narwhals in the frigid water, and protecting them from walrus and male bears in search of an easy kill. We watch as the bears approach each other, the male pausing to sniff the air, the female slowing her gait, sensing the danger ahead. A confrontation seems imminent — with the sheer cliffs on one side and the water on the other, the cubs make an easy target if, that is, the hunter is willing to take on their mother. Then, without warning, the big male slides into the surf, his pale back just visible above the waves, and swims out to sea. The cubs were not worth the fight. My head is aching, my mouth is dry and the rocking of the Zodiac on the way to the land- ing site didn’t help matters much. Like all good expeditions, this one is outfitted with plenty of scotch, and I’d been up late the night before in the company of the naturalist C.W. Nicol, a Welsh-born Japanese citizen who lived with the Inuit as a young man and has returned here over the years with several documentary film crews. 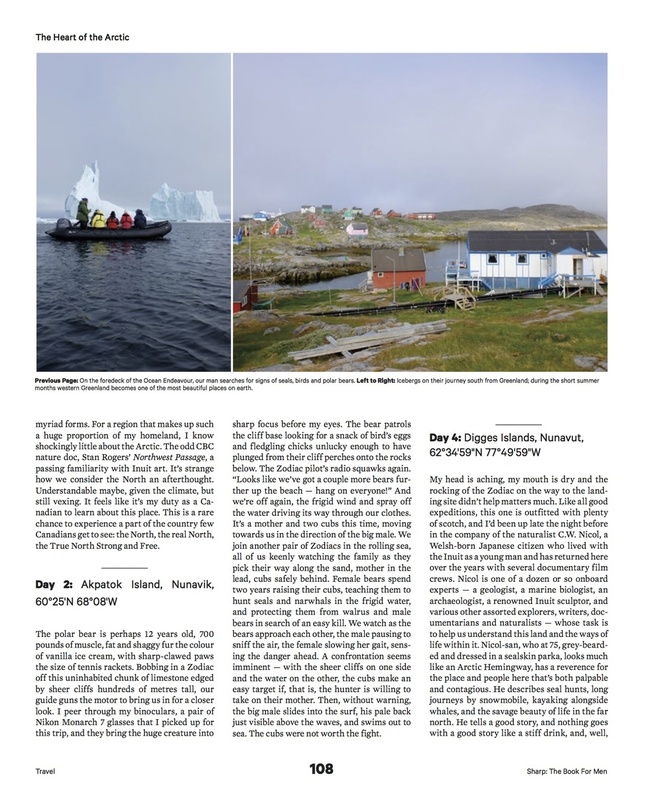 Nicol is one of a dozen or so onboard experts — a geologist, a marine biologist, an archaeologist, a renowned Inuit sculptor, and various other assorted explorers, writers, documentarians and naturalists — whose task is to help us understand this land and the ways of life within it. Nicol-san, who at 75, grey-bearded and dressed in a sealskin parka, looks much like an Arctic Hemingway, has a reverence for the place and people here that’s both palpable and contagious. He describes seal hunts, long journeys by snowmobile, kayaking alongside whales, and the savage beauty of life in the far north. He tells a good story, and nothing goes with a good story like a stiff drink, and, well, one thing led to another. A long, cliff-sided piece of rock jutting out of the Hudson Strait, Digges was the first place western explorers encountered the Inuit when Henry Hudson landed here in 1610. It was home to the Inuit’s seasonal camps for many hundreds of years, and the remains of these settlements can still be seen in the form of stone circles, cairns and inukshuks. On a ridge above, a half-dozen crew form a perimeter armed with shotguns and binoculars, keeping a vigilant watch for polar bears. The world’s largest land predator, a creature that can reach 1,000 pounds and run 40 km/h, the bears easily steal the spotlight, but life in the arctic — especially now during the short summer months — takes on a dazzling array of forms. The ground is covered with deep, spongy tufts of moss, the rocks spattered with lichens in blaze orange, black and pink. Tiny flowers erupt everywhere, spreading their fiery red and yellow petals under the low sun. An Arctic plover chirps and hops in demented circles on the tundra just beyond, feigning a broken wing to lure us away from her nest. A tidal pond thrums with krill and tiny black beetles. The beach is strewn with a dark band of seaweed, laced with white fragments of bone — whale, seal, bird, fish — a jaw here, a vertebra there. Someone shouts and I hurry down the shore to find the carcass of a walrus rotting on the sand, deflated and brown as a corduroy sofa left out for the winter. Qavavau Manumie stoops over a table at the West Baffin Co-operative, making small circular motions with the back of a spoon on a large sheet of Japanese rice paper. Manumie is a printmaker and he works with a steady, even hand, applying ink with the skill of a master. The piece he’s creating depicts an owl with soft, round features, soaring over a landscape of brilliant red lines beneath a pale Arctic moon. Cape Dorset, an Inuit community of some 1,500 inhabitants, is home to the world’s largest concentration of Inuit artists, whose work is sought by galleries and collectors from Winnipeg to Tokyo. One can’t under- estimate the positive impact of this export to the economy of Nunavut, and it would be easy to talk about Cape Dorset and the handful of other settlements we’ll visit on Baffin Island in these terms only. But as rich as this area is in creativity and culture, it’s clear that many here are struggling. The streets of Cape Dorset are dirt, its houses small and simple with snow machines in various stages of dereliction scattered everywhere, empty soda cans litter- ing the ditches. When the Inuit were moved into centralized communities and forced to adopt southern religion, language and culture, a great part of their identity was lost within a generation, and it’s a loss they’re still grappling with. Aside from giving us the chance to marvel at polar bears and whales from the deck of the ship, bringing travellers from the south to these communities is an essential part of Adventure Canada’s mission. We will experience the Inuit’s food, songs and stories while also bearing witness to the effects of hundreds of years of invasion and exploitation — a grim history that’s only beginning to be reconciled. A few days earlier we’d visited the Nunavik village of Kangiqsujuaq. Our guide there runs youth programs in the community, helping Kangiqsujuaq’s teens rediscover traditional ways of life as an antidote to drugs, alcohol and despair. The youth here, he says, are caught between two cultures. Like most everyone we’ll encounter in these northern villages, however, he answers our questions — whether about the loss of Inuit language or the effects of climate change — with the kind of pleasant realism one can only imagine is essential to surviving in the Arctic for a thousand years. He acknowledges that the weather is changing, the water warm- ing, southern animals appearing that haven’t been seen here before, and that this isn’t just a problem for the Inuit. “It’s not going to be the meek who inherit the earth,” he says. “It’s going to be the bugs. [Humans] are all part of one community. We breathe the same air and drink the same water.” He takes us to the com- munity centre where a table is laid with paper plates of dried caribou, Arctic char, chunks of beluga muktuk (whale skin and fat) and a large bowl of wild greens. The whale meat is dense, chewy and tastes of the sea, the greens bright and citrusy. As Manumie’s print progresses, we’re herd- ed towards the end of the room to make space for the next group. My fellow adventurers line up, prints and sculptures in hand, credit cards at the ready. A group like ours can easily spend $100,000 at one of these stops, and Adventure Canada makes a sizeable per-passenger donation to community initiatives on our behalf. After descending en masse, cameras readied in search of authentic experiences and souvenirs before heading back to the ship for another big dinner, bottles of wine, and a sing-along in the Nautilus Lounge, it’s a trans- action that feels only occasionally exploitive. I have no idea how the Inuit feel about our presence, but wherever we appear they are never less than warm, gracious hosts. On the morning of our eight day at sea I wake up to the sound of the ship’s hull scraping across the ice. My cabin shudders with each contact as the jagged edges of the floes strafe the hull, the sound reverberates through the steel and up through my mattress. The Ocean Endeavour is built for just these kinds of conditions, its bow reinforced steel fronted by a massive prow that glides through the water, cracking the ice and pushing it sidewards with the ease of a straw stirring a cocktail. I dress quickly. It’s not yet 7 a.m. and already there’s a crowd gathered on the foredeck. In every direction stretching to the horizon and beyond is a brilliant white expanse of ice in jagged geometric shapes, cut through with lines of dark seawater and marked here and there by icebergs the size of small apartment buildings. Our scheduled stop today, the village of Pangnirtung, is still frozen fast in ice, and our approach through the Cumberland Sound is impeded. On the advice of the captain of the nearby Canadian Coast Guard ship Terry Fox, we change course and will spend our day in- stead skirting the coast of Baffin Island, cutting a path through the sea ice on our way to Greenland. Staring out across the panorama it doesn’t feel like a loss. I had always heard that Iceland was green and Greenland was icy, some kind of tricky sales tactic invented by Vikings to lure people to this massive, remote chunk of rock and glacier. Despite being home to an ice sheet only slightly smaller than the entire country of Mexico, at this time of year Western Greenland, with its covering of soft, green moss and wildflowers, and roving herds of muskox and caribou, is one of the most beautiful places you’ll ever lay eyes on. Kangerlussuaq, site of a former US air base, is a town of about 500 and the only place in the country where Adventure Canada’s chartered 747 can land to take us home. In the morning we leave the ship at anchor in a fjord, driving up into the hills for a view of the ice sheet. In the afternoon we board our plane for home. Be- fore we rise above the clouds the Greenlandic coast spreads out beneath the window, jagged rocky peaks dusted in snow, towering over cold blue ocean. It looks like an alien planet, untouched and primeval, a hostile world unsuited to life. 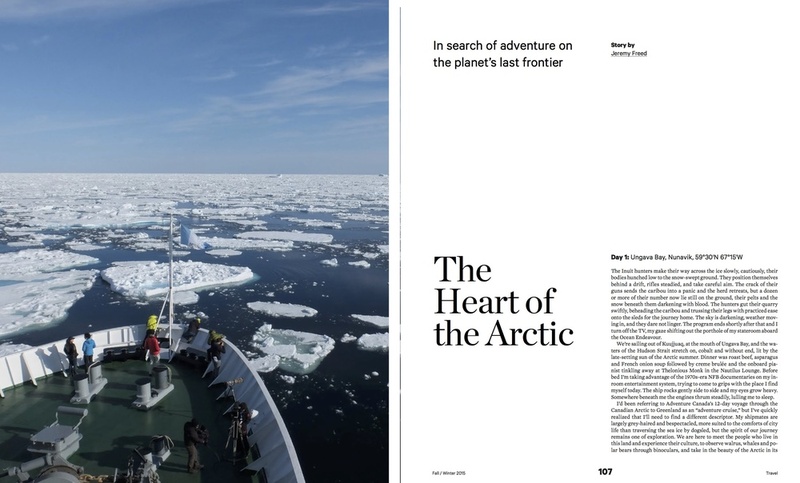 The Arctic might as well be its own planet — things are as unfamiliar here as they could possibly be — but it is far from lifeless. I have been to the Arctic, but I can’t say I’ve seen it, not really. I wanted to leave with some kind of understanding of this place, but it’s too much to take in, too much to digest all at once. To know the north is to be awed by its power and humbled by the life that endures here. I have merely been an observer, watching it pass from the deck of a ship, trying in vain to capture it in lines and pictures, and marvelling at the miracle of it all.